What are some obvious, over-the-top tax deductions? Excessive losses year after year, especially if the losses exceed your full time wages from employment. Excessive travel and entertainment expenses, especially if it appears you took a nice vacation and tried to call it a research expense. I read a lot. Some of the books are to study other writers or my genre. Are the books I read tax deductions? Keep your business deduction for books reasonable and small and they would probably be justified as business deductions. I like to be around people when writing and usually write at my local coffee shop. Is the mileage to the coffee shop a business deduction? Your location to write is a personal preference and not a necessary business expense, but rather a personal expense. The mileage is not deductible. I hired a transcriptionist. Is it a tax deduction? Yes; put the expenses under Contract Labor on the Form 1040 Schedule C tax form. 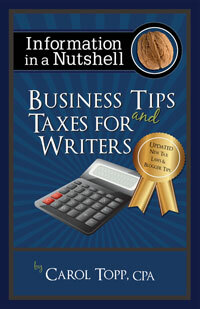 What’s a tax deduction that most writers don’t know about? Gifts given to business clients or your agent, editor, or publicist are deductible. The IRS imposes a limit of $25 per person per year. Some bad tax advice for writers floating around out there! I recently listened to a webinar on Writer’s Digest where you provided some very interesting information. One question I would appreciate your help with is, “How do I submit taxes if I decide to use a pseudonym instead of my real name as ‘author’ when I write and or publish a book? You must use your legal name when submitting taxes since your pseudonym is not a legal person. Your readers will never know that you have a different, legal name. And the tax authority doesn’t care that you use a pseudonym on your books. You could sell books by other authors as well. All they want is their tax. You could think of your pseudonym as a business name or “Doing Business As” (DBA) designation, although its not quite the same thing. BTW, all contracts are signed with your legal name as well. Can I deduct the cost of online publishing courses I enrolled in 2017? I have not made any money yet and have not published yet. I will have a work out in a few months. I am so glad I found you. A member of a writers group on facebook sent me your link. The publishing course is a legitimate business deduction, so yes you can deduct it. But you may want to include it in your start up expenses in the year you make money or actually publish the book rather than deduct it in 2017 when you have no income from the business. It looks suspicious to the IRS to have business expenses but no income.